I didn’t realize it right away, but today I reached a milestone goal in my weight loss adventure. If you haven’t read my previous weight loss story, it’s here. Anywho, now that you’re caught up on my weight loss journey I can get into this milestone! This morning I weighed in at 134.5 pounds (or 61 kilograms), I logged it into my excel sheet (working to make one available for all my subscribers -YAY!!! ), logged it into MyFitnessPal, and TwinBody (because I’m OCD and need to keep it up to date everywhere). Eventually, I noticed on TwinBody that my goal weight was 135! Craziness! I set that goal ages ago, when I lost 40 pounds I didn’t realize I was only 5 pounds away from my first goal weight! To be fair, I aim to lose 1 pound a week, so 5 pounds = 5 weeks, which feels like forever. Anyway! 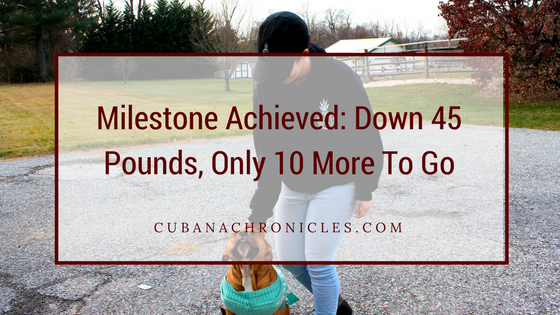 I’m literally dying of excitement that I hit this goal a little ahead of schedule (thanks to getting all 4 of my wisdom teeth pulled)! Cool, Meagan – What now? Another milestone? Now, I’ve set another goal – lose 10 or 20 more pounds. I’m technically in the upper levels of what is considered a “healthy weight” for someone my size, I feel awesome, but I know I can do better. I’m not even specifically looking for a certain number on the scale, but I want to look better. I don’t have some crazy image of being shredded, but I know I won’t disappear into thin air if I drop down to 115 to 125 pounds. I have about 13 weeks left before I graduate college, so ideally that means I’ll lose 13 pounds – which puts me around 122 pounds. I’m not starving myself or being super strict during the holidays, though. I’ve managed to lose weight even while celebrating 2 Thanksgivings (one with my boyfriend’s mom and another with my family) thanks to the tips and tricks I talked about here. So I fully intend on eating whatever and however I want on Christmas Eve (because Hispanics do the big dinner on Christmas Eve – Noche Buena), and on New Years Eve. We’ll see how this goes!! !